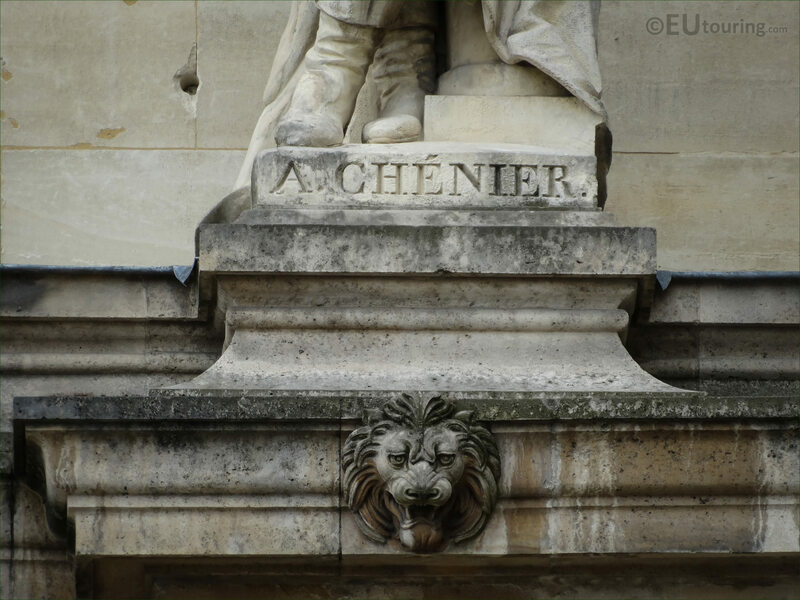 Again we were admiring the facade of the Aile Henri II wing of the Musee du Louvre from the Cour Napoleon courtyard in the 1st Arrondissement of Paris, when we took these high definition photos of a statue dedicated to Andre Marie Chenier, sculpted by Auguste Preault. 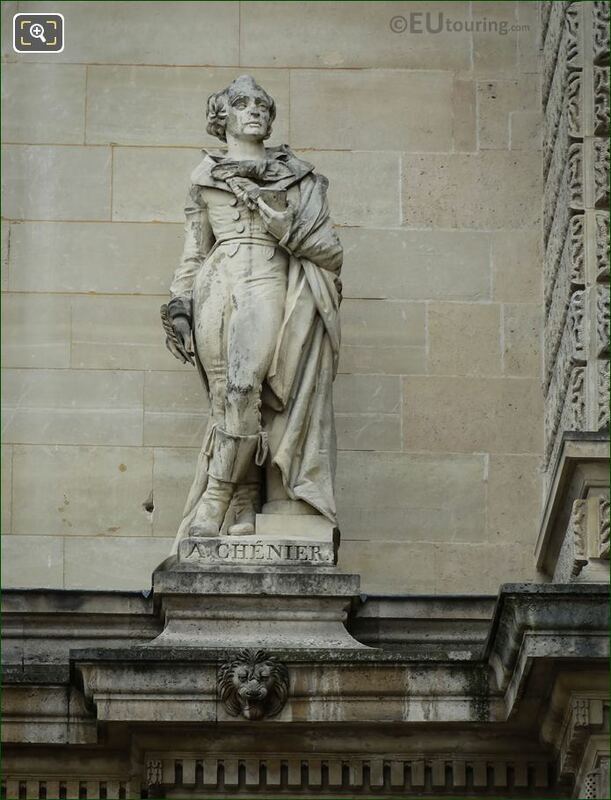 So this first HD photo showing the statue of Chenier is located on the first level balustrade of the Aile Henri II wing of the former Palais du Louvre, and looking at the facade from the main entrance courtyard, this is located third from the right hand side. 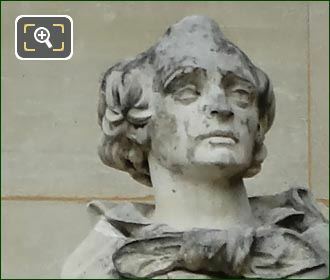 Now this stone statue was produced by Antoine-Augustin Preault, normally just known as Auguste Preault, and born in Paris on 9th October 1809, he became a medallist and sculptor, yet struggled for many years not being able to get into the prestigious Ecole des Beaux Arts, nor being allowed to present his works at the Paris Salons. Yet recognition came during the Second republic and the Second Empire, when he did receive different commissions, including a statue for the Luxembourg Gardens, another for the Pont d'Iena and of course this statue of Chenier for The Louvre. But tragedy still struck this French artist, and when his parents died he became exceedingly lonely and started producing medallions of his childhood friends along with other sculptures, yet during the Paris Commune his home and studio were burned down and many of his works were lost forever. And weakened by all these events and illness, Auguste Preault eventually passed away in 1879. 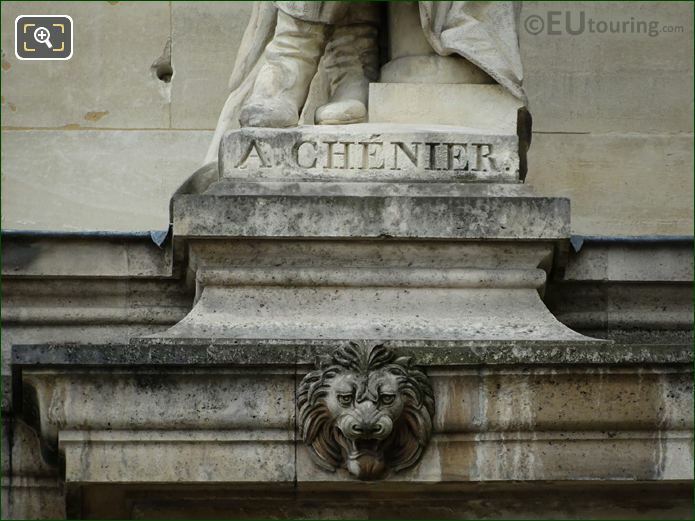 And in this last image you can see the plaque at the base of the stone statue depicting Andre Marie Chenier who was born in October 1762 and became a French poet, with his expressive and sensual way of writing, he was one of the precursors to the Romantic movement. 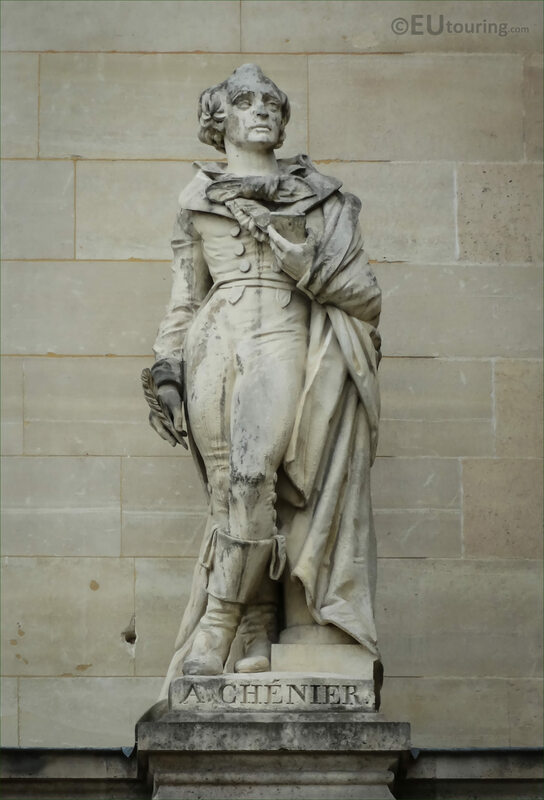 However, there is a tragic ending to this person as well, when his career and life came to a very short and abrupt end, because after being accused of crimes against the state during the French Revolution, he was guillotined on 25th July 1794, which was towards the end of the period in the history of Paris, known as the Reign of Terror.